"Protection from terror and other dangers, such as home and office building fires, really boils down to buying time," says Joe Gehr, CEO of Miami, Florida-based Technon, LLC, "Time to escape from the point of danger to a safer zone. Buying 15 critical minutes can save your life." The Breath of Life™ provides the wearer 15 to 20 minutes to escape from an attack scene or a burning building with the ability to breathe without inhaling smoke or fumes. Available for personal and commercial use in the U.S. for the first time, the Breath of Life™ mask—pocket-sized and weighing less than one and a half ounces — can be carried in a briefcase or pocketbook. Fits easily over the head, including beards or glasses, and closes tightly around the neck, protecting the head, face and eyes. One size fits all. 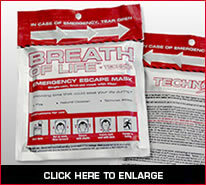 The Technon Breath of Life™ Mask embodies The Science of Survival.